Thirty years as a diplomat has taken Peter Boehm around the world. Working for the Canadian government in various foreign relations positions, the Laurier alumnus has held posts in Germany, Cuba, Costa Rica and Washington, D.C. and attended summits all over the globe. But now, Boehm’s work in foreign relations has taken him somewhere a bit more familiar: his alma mater. For a little over a year, Boehm (BA ’77) has served as the deputy minister university champion for Laurier, part of a program aimed at increasing connections between Canadian universities and the federal government. In this role, Boehm works with Laurier to develop opportunities for students, and looks for ways he can assist the university in his capacity as a deputy minister. Perhaps it’s appropriate that Boehm’s career in the Foreign Service has brought him back to Laurier; it was during his undergraduate days at the university where his interest in international relations took shape. As an English and History student at Laurier, Boehm was fascinated by Canada’s place in the world and its relationships with other nations. He took courses in various types of history and foreign relations, while staying well-read through his English degree, particularly enjoying a fourth-year English literature course taught by beloved Laurier professor, the late Flora Roy — “that course marked me for life in a very positive way,” Boehm recalls. When Boehm started at Laurier in 1973 the campus consisted of only a handful of buildings — “I remember the big new development was the Athletic Complex and now that’s probably considered an older building,” he says — and the initials “WLU” still stood for Waterloo Lutheran University; the institution would officially become Wilfrid Laurier University a few months into Boehm’s first year. Boehm has fond memories of his time at Laurier, from the intimate campus atmosphere, to the small class sizes, to late nights at The Turret and his time as a DJ on Radio Laurier. He even got a chance to see one of Canada’s most iconic bands on campus before anyone knew who they were. “There was this grass amphitheatre behind Conrad Hall and I remember one orientation week there was this band in from Toronto, just these three young guys and there was maybe 50 people there,” he remembers with a laugh. 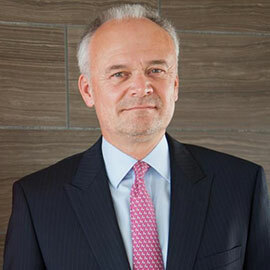 After graduating from Laurier, Boehm earned a master’s degree in International Relations from Carleton University and a PhD from the University of Edinburgh. When he couldn’t find a job in academia, working in international relations was the logical next step. “No university would have me as a professor so I wrote the Foreign Service exam and I’ve been doing this ever since,” he jokes. In all, Boehm has spent about 18 years of his career abroad. He’s served in various positions such as minister of political and public affairs at the Canadian embassy in Washington, D.C.; Canada’s ambassador and permanent representative to the Organization of American States, also in Washington; and ambassador to Germany, a perfect fit for the Kitchener native who grew up speaking German and English. Currently based in Ottawa, Boehm helps develop Canadian foreign policy and works with governments around the world on issues such as international responses to natural disasters, tensions between nations and the global fight against terrorism. He also serves as the Prime Minister’s personal representative — known as a sherpa — for the G-7 Leaders’ Summit and the Nuclear Security summit. In his capacity as Laurier’s deputy minister university champion, Boehm enjoys the opportunity to share his experience, as well as hear new perspectives from students looking to join the field he’s worked in for more than 30 years. Boehm has already worked with Laurier to set up a trip to Ottawa for international public policy students to get first-hand experience of what it’s like to work in the Foreign Service. In the future he hopes to set up mentoring opportunities for students, guest lectures from government officials and further connections between Laurier and the federal government.